SHE SAID " IT'S MAGIC "
 The three-day road trip home from the convention was filled with a mixed bag of emotions for me: happiness, sorrow, gratitude, devotion, and a relentless questioning inside of myself. As Pen sat in the car next to me, asleep, I let my mind and heart weave in and out. I tried to make sense of everything I felt. A month ago, I had felt indifference about attending the convention. True, I still watched Xena every week. I still reserved 7:00 p.m. on Saturday for a certain Warrior Princess. I may not have remembered the episodes with as much detail as I had in the past, it was still Xena, and she remains a fixture in my life. My life in fandom has changed for me over the last year and a half. I do not chitchat as much due to a back injury and in all honesty, I just do not have all that much to say about the show anymore. I still enjoy it and love the characters, but the need to debate, discuss, or criticize has long passed. I was happily surprised to find that making the trek to Pasadena brought me back in touch with the bond so many of us feel with Xena. As Pen sat in a warm, deep, breezy sleep next to me -- windows down, top still up, back window zipped open -- I drove north on I-5. It was about 8:00 p.m. and the sun had about a half hour left before it sank behind the golden baked hills of central California. It was not until I passed a small town called Coalinga that it hit me. I had had no time to really think about or feel my feelings on Sunday after watching Lucy Lawless and Renee O'Connor up on stage during the convention. It was our last night in Pasadena, there were good friends to see, and one last night to spend swapping stories, discussing God, eating quesadillas, and drinking a beer or two. I drove squinting into the glaring sunset and began to cry. A cry that was felt deep in my heart and my gut. The show was ending and there was so much more I wanted to say. To whom, I had no idea. There was just SO much more I wanted to understand about this silly little action/adventure show that had changed my life, forever. I met my beloved on the Xena NetForum and the moment I was aware of the love and connection I felt for her I blurted out "Who the f*** are you?!" The feeling I felt in my car driving north past a little podunk town in central California was just about as overwhelmingly strong and definitely as questioning. 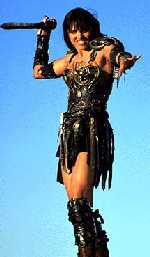 As I looked at Pen in the beginning of our relationship, I look at Xena: Warrior Princess now. I am in love, and God only knows the hows, whys, and wheres of it all. I can tell you all the lovely things about my beloved, all the ways she fills the voids in my life, all the times she has eased my pain with only a look or a touch, but it will never fully convey what she means to me. There are no words. Xena has given me as much. Xena has been my friend. She has touched me, she has comforted me, she has made me laugh, and she has given me hope in times of despair. She has helped me find my own strength and my compassion for others. She has shown me my own faults and my own need for redemption. Most of all, though, she has shown me love. Without Xena, I would not be here, living a committed life with my loved One where I continue the daily struggle of trying to become the most loving and compassionate person I know how to be. The tears of saying goodbye will never really dry up and I am not sure I would want them to completely. There is something very bittersweet in saying goodbye to the gorgeous tall dark warrior and the adorable short blonde bard. Anon was born in Olympia, Washington 42 years ago. She lived in New York City while studying photography. She then became bored with that and decided to prospect for gemstones in the Southwest. Having fulfilled all her prospecting desires she then decided to learn how to fly airplanes so she could be an explorer of the skies. Having accomplished her piloting goals she is now living a very peaceful and content life on Puget Sound with her own real life Gabrielle.